Lots of things to see here, from mid-eighties to recent times: treats such as Les Enfants du rock while recording Be Yourself Tonight (we’re still in the process of putting all the multiple takes together) or the making of Beethoven video clip, along with the most boring interviews ever seen. 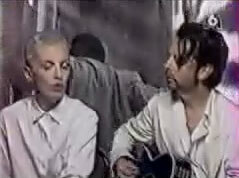 As for most of Europe, we didn’t get a lot e* related stuff on TV since 2000… Annie Lennox briefly portrayed in 2003 (no original footage), some mentions of Dave Stewart here and there and that’s it. A2 (Antenne 2): second channel.